One of my favorite projects of the year begins today as students from the Melrose Veterans Memorial Middle School will gather to discuss Operation Remember, our year-long commitment to honoring the Korean War. The highlight of Operation Remember is our annual trip to Washington D.C. This year we plan to take students and veterans to the city's major veteran memorials in addition to Arlington National Cemetery to pay tribute to Korean War fallen who have roots in Melrose. The trip's final event will be a special ceremony at the National Korean War Memorial, one of the most beautiful veteran tributes in the word. Operation Remember will also dedicate a Melrose Korean War Memorial. The city does not have a stand-alone Korean War Monument and we aim to install one in time for Memorial Day 2015. Fundraising already began with our first annual Melrose Veteran Open and portions of Operation Remember fundraising will also help us make our Korean veteran no longer forgotten. The monument, currently in the design phase, will feature the likeness of at least six Melrosians who gave their lives in Korea. We are currently signing up interested veterans and beginning fundraising and research. Stay tuned for more information about this important project. 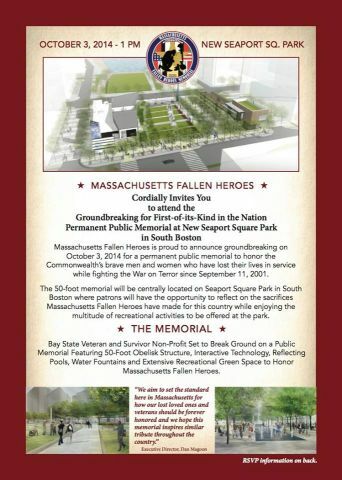 Ground Breaking Ceremony Friday, October 3rd at 1 p.m.
We will be attending the ground breaking ceremony next Friday to support the construction of a permanent public memorial honoring Massachusetts service members who gave their lives in conflicts following September 11, 2011. The ceremony will take place at 1 p.m. at the New Seaport Square Park in South Boston. Memorials such as these represent a commitment by local communities to support a permanent remembrance for those we have lost and those families still dealing with the tragedy of sacrificing a loved in service to a grateful nation. We encourage you to join us as we support this important effort. To see more about the monument and its design, visit the Massachusetts Fallen Heroes Web site. Our booth, located in tandem with Mayor Rob Dolan near CVS on Main Street, will feature members of the Melrose Veterans Advisory Board selling raffle tickets and sharing information about upcoming veteran events. Former Alderman and Vietnam Veteran Bill Forbes donated a jersey signed by the one and only Cam Neely. We will raffle this item in addition to a game ball signed by Dustin Pedroia in an attempt to raise money for the Melrose Veteran Memorial Restoration Fund. This fund, newly established this summer, will serve to restore and establish monuments dedicated to the military service history of Melrose residents. First on the agenda is the creation of a monument dedicated to the women of Melrose who served in our armed forces. This monument dedication, scheduled for installation during Veterans Day 2014 celebrations, will feature women who served in wars ranging from WWII to Iraq and Afghanistan. Our long-term target is the installation of a monument dedicated solely to Korean War veterans. Hundreds of Melrose residents served in Korea during a conflict that claimed more than 38,000 U.S. lives including 6 men with ties to the City. On Memorial Day 2014, we will install a monument highlighting this service and sacrifice. Your raffle ticket purchases will help fund this effort. Stop by our booth for more information about veteran benefits, the Melrose Veteran Open scheduled for Sept. 12 at Mount Hood, our POW/MIA dedication to Minor McLain on Sept. 19 and our POW/MIA Day Food Drive at Shaws on Sept. 20. We look forward to meeting you on one of the best days in Melrose! Support your veterans and the Victorian Fair! The CPL Scott J. Procopio American Legion Post 210 on Taylor Street will again be serving breakfast to area veterans and guests starting this Friday. The breakfast is a great chance to connect with local veterans and keep informed about information and events important to our community. We hope to see you at one of these gatherings soon as we and members of the Veterans Council frequently attend.